Badan Penyelenggara Jaminan Sosial Kesehatan - BPJS Kesehatan is the national health insurance agency of Indonesia. 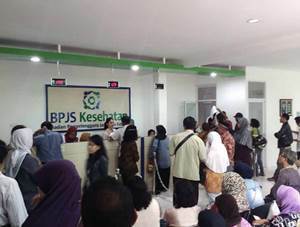 BPJS Kesehatan is a state-health insurance agency in Indonesia which is fully-owned by the Government of Indonesia. The agency was formed on 31 December 2013 under Law No 24 of 2011 to replace the function of state-owned health insurance agency PT Asuransi Kesehatan Indonesia (Persero) or commonly known as ASKES. Headquartered in Jakarta, the agency now has 12 regional offices and 104 branch offices spread across Indonesia. The agency's head office is registered at Jl Letjend Suprapto Kav 20 No 14 Cempaka Putih, Jakarta Pusat 10510. Achievement and performance of BPJS Kesehatan in 2014 shows good results achievement. According to BPJS Kesehatan's latest news release as quoted by JobsCDC.com, BPJS Kesehatan registered total participants of 133.4 million people as at the end of December 2014. These total participants figures reflected an 109.72% increased from the target set in 2014 which was 121.6 millions participants. Maximum age of 45 years old on 31 July 2016 (Calon Anggota Komite). Maximum age of 38 years old on 31 July 2016 (Calon Sekretaris Dewan Pengawas). Minimum 6 years of experience in the related field (Calon Anggota Komite). Minimum 6 years of experience in the field of fields of management of administration, secretarial, Procurement of Goods and Services in the Ministry / Institution or company. Background in S2/S3 in the field of Finance, Economics, Accounting, Hospital Management, Health Insurance, Law. Special for Hospital Management and Health Insurance with education background in professional General Practitioner. Minimum GPA of 3.00 from a leading university (accredited A). Computer literate (MS Word, MS Excel and MS Power Point). Active in English language and possess TOEFL certificate with minimum score of 500. JobsCDC.com now available on android device. Download now on Google Play here. Please be aware of recruitment fraud. The entire stage of this selection process is free of charge. Badan Penyelenggara Jaminan Sosial Kesehatan - Recruitment PTT Staff BPJS Kesehatan July 2016 will never ask for fees or upfront payments for any purposes during the recruitment process such as transportation and accommodation.